Wenyen Gabriel was up and down in his week in Portland, having a difficult time finding a niche in his very first USA Basketball experience. His best moments came when he was banging inside the paint with his excellent motor and knack for coming down with offensive rebounds, but with his very underdeveloped frame (197 pounds), he wasn't always able to stay effective going up against the many bigger and stronger players he encountered. Gabriel is particularly weak in the lower body, and his frame will likely take considerable time to fully mature. He's a good, but not great athlete, on top of that, as he's not exceptionally explosive, even if he does have solid length. Offensively, Gabriel is not overly skilled, relying mostly on his energy to get the job done. He can make an occasional spot-up 3, showing decent touch on his jumper, but is not terribly consistent with this part of his game. He plays very sped up when forced to create his own offense, and shows questionable awareness and decision making skills at times. He seems more effective operating off the ball where his motor and length can make up for his limitations as a ball-handler. Defensively, Gabriel has some limitations due to his frame, but plays incredibly hard to compensate. He flies around and will put his body on the line to try and make his presence felt, but at times looks a step slow with his awareness. Highly intelligent off the court, and reportedly a superb worker, Gabriel is clearly on a different trajectory than other players his age, as he's a very late bloomer who wasn't considered a high-level prospect until very recently. He struggled at times in Portland, but has a chance to emerge as an excellent college player at Kentucky, where he'll be forced to work on his body and skill-level and learn more about his limitations. Measuring out identically to his listed numbers in our first set of official data points he's appeared on, Gabriel has solid size for a power forward, particularly at the college level, where his measurables would compare favorably to players like Amile Jefferson and Brice Johnson. Lacking tremendous length and bulk relative to players at his position in the NBA, it will be interesting to see how Gabriel's body responds to Kentucky's strength and conditioning program, which has worked wonders for a number of the elite prospects they've brought in over the last few seasons. 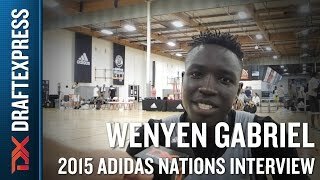 An interview with power forward Wenyen Gabriel at the 2015 adidas Nations in Los Angeles. -Decent size for a power forward at 6-9. Reportedly has a 7-1 wingspan, which is very solid. -Will make an occasional spot-up 3-pointer. Doesn't have a bad stroke. Good mechanics and smooth follow through. -Has a very narrow frame. How will it fill out long term? Lower body in particular is poor. -Shoots a lot of jumpers, but doesn't convert very many at this stage. 14/59 (24%) from 3-point range this summer. Outlook: One of the fastest rising prospects in high school basketball after a breakout summer on the AAU circuit. Went from virtual unknown to five star status according to most recruiting outlets. A native of Sudan, Gabriel moved to the US when he was three years old, together with his parents, brothers and sister Karima, who currently plays basketball at Boston College. He reportedly shot up around nine inches in the last four years, which helps partially explain his comfort level playing on the perimeter. Gabriel's AAU coach Vin Pastore says Gabriel has added 20 pounds to his frame in the last year, which tells you something about just how skinny he's been in the past.